Reminder: No School for students tomorrow (Friday 18 January) as it is a Curriculum Implementation Day across the entire NVSD 44 School District. 1) Continue to post comments on the Cooper’s Edge school blog in the UK. The next times tables quiz will officially be the 4 times tables in several weeks. If your child did not pass (22/25 or better to pass) the timed quiz for 9 times tables, they can ask me to retake the test any Thursday. We viewed several videos today, shot from underwater, or above rivers, showing the kinds of stream beds that salmon favour for spawning (rocky or gravel bottoms), and we watched as some salmon spawned. We then summarized our learning with three sections: new vocabulary, Needs, and obstacles. That was compiled into the attached doc. The salmon are coming! The salmon are coming! In Science we are studying Renewable and Non-renewable Resources of BC, and we will start with a study of the Pacific salmon. In less than two weeks we will receive over 100 wild salmon eggs which we will raise until they hatch and grow into strong little fry, in April, at which point we will release them back into the wild. Our first handout was available today, and I’ve posted it here too. Tomorrow we will have a short quiz on the life cycle of the Pacific salmon (F). I’d also like the students to have their title page for the Salmon unit handed in too (F). Reminder: Students should be preparing for a timed test on the 9 times tables (next week). Also, if students haven’t posted a new blog today, they should do so tomorrow, for this is “our” week to shine. The next several weeks we will be reading and commenting on blogs from our other partner schools. Finally, if there aren’t any last minute book orders, we’ll send the January Scholastic order in tomorrow (F). Q: If you can only use I, V, X, L, and C, what is the largest number you can make? Today we worked on coming up with our own divisibility rules. Some are easy (like the rule to know if any number is divisible by 5 (it always ends with a 5 or a 0), some are harder (like the divisibility rule for 9: add the digits together; if they equal 9, then the number is divisible by 9. Eg: 54 = 5 + 4 which does = 9 so 54 is divisible by 9. Eg: 378 = (3+7+8) = 18 = (1+8) = 9 so 378 is also divisible by 9, but 4004 (4 + 4 ) = 8 is not divisible by 9. The January book order has been made available to students. If you’d like to take part, please have the orders (cheques only please, no cash) in to me by Thursday. As I have done for many years, I have signed our class up for the Salmonids in the Classroom program. 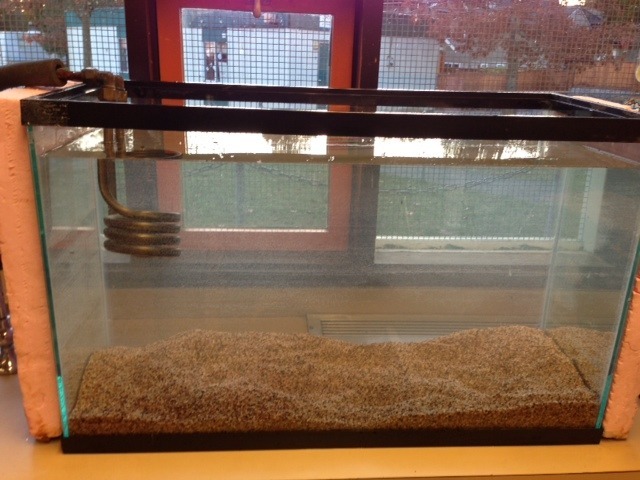 In about 2 weeks we will receive over 100 wild salmon eggs which we will incubate until they are ready to be released back into the wild after the Spring Break. Accordingly we will get our tank set up about a week early (ie: next week) so our water for the salmon to live in will be properly conditioned for their arrival. I hope you and your family had a restful, relaxing holiday, as I did. Mine was made doubly special because of the thoughtful cards and gifts you gave me. It is an honour teaching these lovely children, so those gifts and cards were like icing on the cake… very much appreciated!! 1) In art, Mrs. Martin asked the students to find out from parents who “JFK” was, and specifically who Mrs. Jacqueline Kennedy was and what she represented to the American people. 2) In Math, I challenged the class to determine what the largest number would be if in Roman Numerals you only had 1 = I; 5=V; 10= X; 50 = L; and 100 = C to work with. 3) I’ve asked students to write another blog post today at <a href="http://www.kidblog.org/WestCoast. 4) Scholastic book orders went home today. If you’d like to take part in the January order I would just remind you that I can’t send cash in the mail, cheques only please, made out to Scholastic Canada.